Something strange is happening on top of the world. The Earth’s magnetic north pole has moved far from Canada toward Siberia, driven by splashing out of liquid iron in the core of the planet. 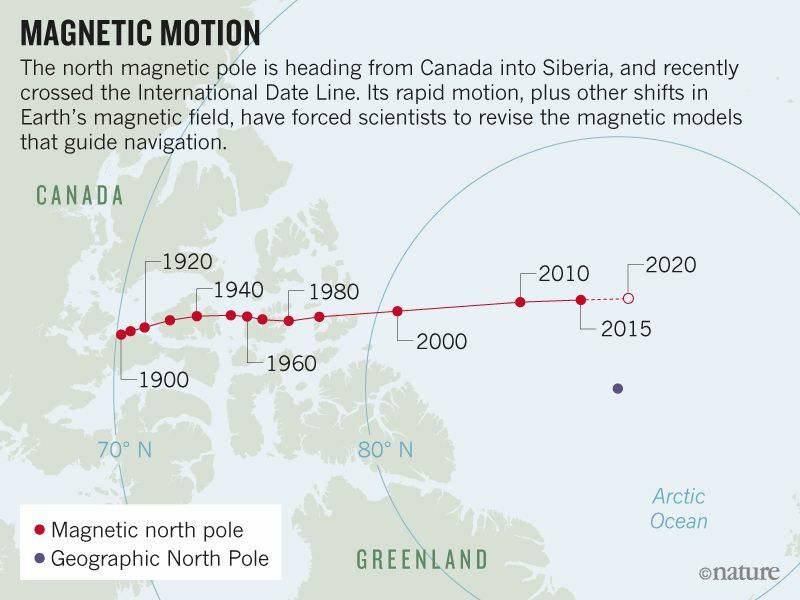 The magnetic pole is moving so fast that it made world geomagnetism experts amend the existing “magnetic model” of the world. On January 15, they are going to update the Magnetic Model of the World, which describes the magnetic field of the planet and underlies all modern navigation, from systems that control ships at sea, to Google Maps on smartphones. The latest version of the model was released in 2015 and was supposed to last until 2020 – but the magnetic field is changing so quickly that researchers must now correct the model. “The deviation is constantly increasing,” say scientists. The problem is partly related to the moving pole, and partly to other shifts deep in the planet. The fluid that foams in the core of the Earth generates a large part of the magnetic field, which changes with time as the depths of flow change. In 2016, for example, part of the magnetic field temporarily accelerated deep beneath the north of South America and the eastern part of the Pacific Ocean. Space satellites, such as the European Space Agency’s Roy mission, tracked changes. By the beginning of 2018, the World Magnetic Model had problems. Researchers from NOAA and the British Geological Survey in Edinburgh annually tested how well the model captures all changes in the Earth’s magnetic field. They realized that it was so inaccurate that it had to exceed the allowable limit for navigation errors. “This is an interesting situation in which we find ourselves. What’s happening? We do not know … ”says the researcher. Geomagnetic momentum in 2016 under South America came at the most inopportune moment, immediately after the update in 2015 of the World Magnetic Model. This meant that the magnetic field shifted immediately after the last update for unclear reasons. The movement of the north magnetic pole exacerbated the problem. The Pole wanders in unpredictable ways that surprise researchers and scientists since James Clark Ross first measured it in the Canadian Arctic in 1831. In the mid-1990s, he picked up speed – from 15 kilometers per year to 55 kilometers per year. By 2001, he entered the Arctic Ocean – where in 2007 the team, which included Chulliat, landed on sea ice in an attempt to find a pole. In 2018, the pole crossed the International Date Line in the Eastern Hemisphere. Currently, he is rapidly moving to Siberia. Meanwhile, scientists are working to understand why the magnetic field is changing so drastically. Geomagnetic impulses, similar to the one that occurred in 2016, can be traced to the “hydromagnetic” waves arising from the depth of the core. And the fast movement of the north magnetic pole can be associated with a high-speed jet of liquid iron under Canada. It looks like the jet smears and weakens the magnetic field under Canada, said Phil Livermore, a geomagnetist from the University of Leeds, United Kingdom, at a meeting of the American Geophysical Union. This means that Canada is essentially losing magnetic rope pulling with Siberia. “The location of the north magnetic pole appears to be determined by two large-scale magnetic fields, one near Canada and one near Siberia and Siberia wins in this competition …,” says Livermore.